First, let me start this article by saying that you do NOT need an external microphone, nor do you need to spend a lot of money on high tech gear for your audio. I have done several live webinars using my built-in laptop microphone. Below is my personal webinar setup. 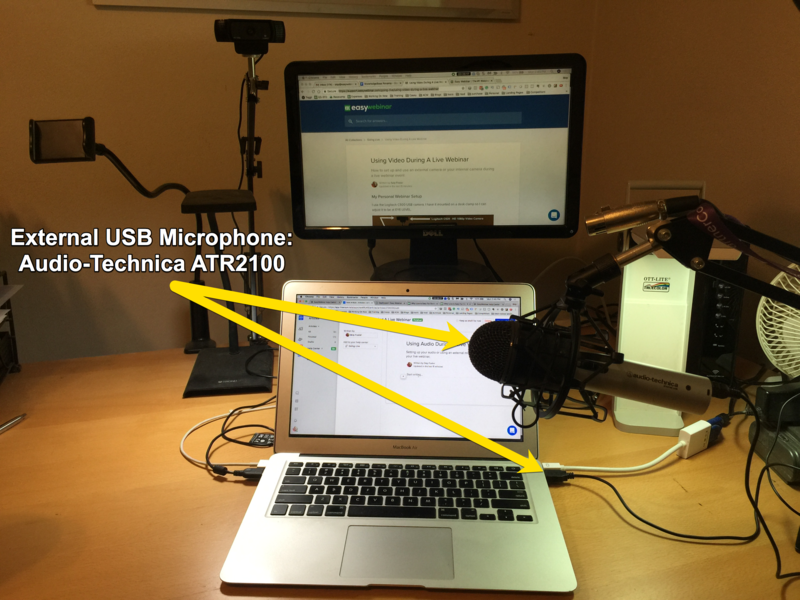 I use the Audio-Technica ATR2100 USB mic. Have you heard the phrase "Content is King"? In a webinar good audio is king. Attendees can overlook a low resolution camera, but if they can't hear you you will lose them fast. Any internal built-in or external USB microphone will work with your live webinar. Be aware of your microphone's quality by testing it before you go live. Test test test. Run a demo test to verify your built-in microphone is not muffled sounding. Your internal microphone is directly connected to the table or desk you are using so be careful to not tap or bang the table too much. Talk with your head facing the microphone. Turn off blowers or A/C and heaters if they are considerably loud. Internal microphones tend to pick up EVERYTHING. Pets, kids, people in a room next door. Be aware of your surroundings. Double check the USB cable is securely connected. Most external microphones are of a higher quality than you internal microphone. Place your microphone close to your mouth and don't turn your head too much away from it. Turn off external sounds around you like fans etc. If your microphone is mounted to your desk be aware of your hand taps and desk bangs while you speak. Headset microphones work great for webinars. However, you get what you pay for. A cheaper headsets can also equate to a lower quality microphone.